Schedule see the information given below. see the notification for application details. 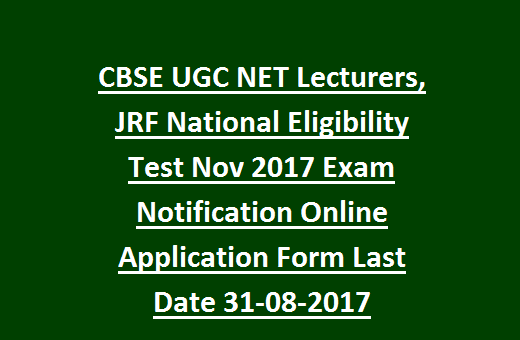 CBSE UGC NET Online applications starting date: 01-08-2017. Admit Cards Available from: 01-11-2017.
marks (for General & OBC, 50% for SC/ ST/ PH/ VH candidates). 28 years as on 01 January 2017. Upper age relaxation for SC/ST/OBC/ PH candidates is 05 years. For Lectureship NET there is no upper age limit. on same day for 200 marks and the time duration is 3hrs. candidate's scientific knowledge/ application of the scientific concepts. candidates is Rs.500/- and for SC/ST/PH or VH candidates is Rs.250/-. online candidates are required to go through the official notification of CBSE for guidelines to fill the form. Last date for submission of application form online is 15-08-2017.